David Richard/ReutersDamian Lillard and Kyrie Irving will face each other Tuesday night. The Portland Trailblazers visit the Cleveland Cavaliers Tuesday night in a game that will feature two of the NBA’s best point guards. The Blazers’ Damian Lillard and the Cavs’ Kyrie Irving are among the NBA’s elite players, and it’s widely believed that neither player has reached their peak. Lillard, 24, and Irving, 22, are both All-Stars and still growing. 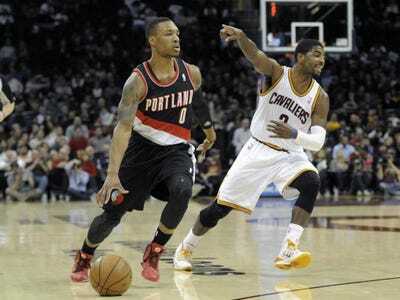 Lillard has displayed the quick release that Irving mentions in several big moments in his three-year career. He became a household name last spring when he hit the Blazers’ game-winning shot over the Houston Rockets in Game 6 of the playoffs. Lillard also beat the Cavaliers last year on a game-winning three-pointer, knocked down a difficult shot over the Pistons in 2013, and hit another game-winning three-pointer over New Orleans in 2012. In an appearance on “Conan,” Lillard said he honed his shooting skills as a kid by nailing milk crates to telephone poles and learning to shoot without a backboard.